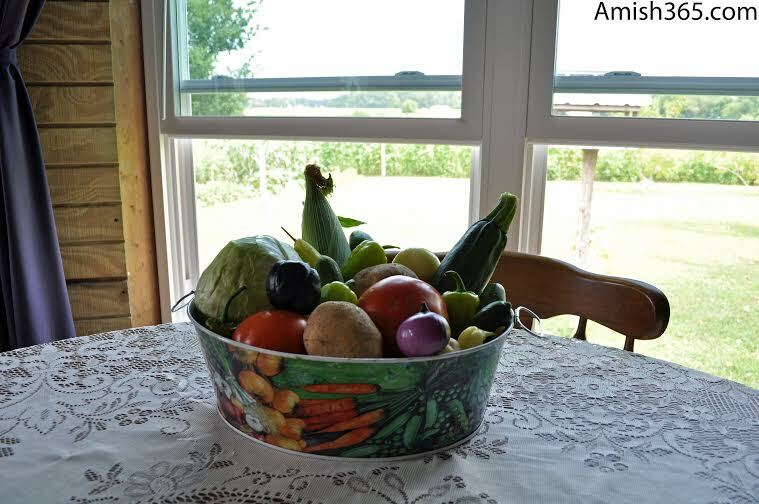 CAPTION: Fresh veggies from Gloria’s garden sit on her kitchen table. Hi. I’m Gloria Yoder, age 24. I’m an ordinary Amish housewife and mother and, yes, I love it. My husband Daniel and I have been blessed with over 4 years of marriage. We were thrilled when God added a baby girl to our hearts and lives 2 1 /2 years ago. We named her Julia Rose. She is our little sunshine. We also anticipate the arrival of another bundle in November. Julia is all excited about being a big sister. We live in a quiet country area and enjoy spending time outdoors, especially going on picnics and camping trips. A week ago we had the opportunity to go with my family to the Embarras River for a camp-out. We had a wonderful time together. My favorite part of camping is sitting around the fire after dark singing or swapping stories. A campfire is never complete without having some good s’mores. I love roasting marshmallows to a golden brown. Then placing on a graham cracker square, spread with an ample amount of peanut butter and topping it with a square of milk chocolate. Presto, you’re done! That’s it all, all except lazily sitting back and munching it down as the fire crackles cozily. Another favorite activity of mine are the early morning walks I’ve been taking. I never cease to marvel over the melodious songs of the birds and the invigorating morning air. It also gives me the chance to spend some quiet moments with God in prayer. Daniel and my brother Javin are both wood-workers. They build log furniture. Their shop is located at my parents home which is less than a quarter mile from our house. Julia loves spending time with her daddy and is constantly begging to trail after him wherever he goes. Sometimes she goes with him to the shop and, of course, ends up going to Grandma’s house. Right now Daniel is mowing the yard with our walk behind mower. Julia is perched on top of his shoulders, something she relishes and makes her feel like she’s on top of the world. Summer is here in full swing. Along with it comes gardening, canning, and freezing. Even though it is the busiest and hottest season of the year, I have found it to have many blessings.. There’s nothing quite like eating that first corn on the cob, spotting a red tomato for the first time or picking that tiny cucumber that hasn’t quite matured yet. 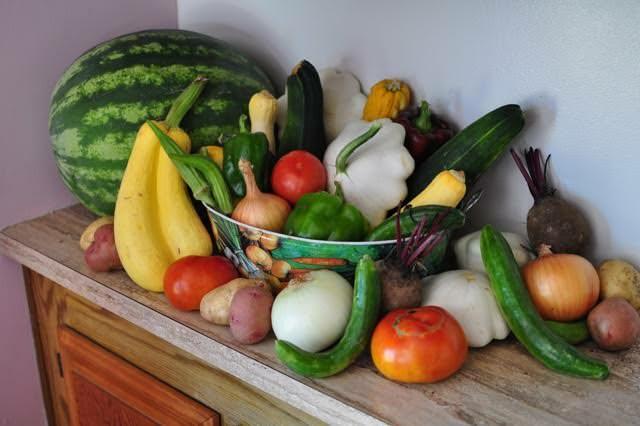 Gathering fresh veggies from the garden is a highlight. To me, the vegetables taste better than candy. This year I want to try something I haven’t done before. We are planning to have a fall garden. It’ll give us the opportunity to have fresh garden goodies for a more extended period of time. Another advantage is I won’t have to do as much canning during the warmest part of harvest season. My parents have a family cow which we all benefit from. That way I can use all the milk I need and want. We have found it to be useful in so many ways. Julia loves drinking raw milk, while Daniel’s favorite is the chocolate coffee smoothies (watch for the recipe in an upcoming column!). I also make pudding, yogurt, cheese, pies, etc using the fresh milk. I use the cream for making butter and the buttermilk for cookies, biscuits, or pancakes. For my first recipe I thought I would share something that is a favorite around here: peanut butter crumb pie. My husband’s eyes light up when he finds out I am preparing it, because he loves this pie and it was served at our wedding! Mix "crumbs" mixture until crumbly. Sounds really good but WAY too many, Breaking down this recipe into 1 or 2 pies would be a bit difficult. Maybe I read it wrong is it for 6 pies? Lady, I correct it, that should make more sense, thanks! Love the new columnist….I will miss Lovina and hearing about her family but I think it will be wonderful learning about Gloria and her family. I am particularly excited about the fact that she does all her cooking from scratch…so do I as I think it is a far healthier way of cooking…all of the processed foods on the market today are full of things we should not be eating. I think you have done a great job in replacing Lovina and I look forward to many more columns from Gloria. Welcome Gloria! I enjoy your enthusiasm for cooking and your family. I look forward to your future columns and recipes, nice to have you here. Does this mean no more Lovina Eicher? That makes me sad if so. I’ve been reading her columns ever since she started them. I told one of my friends, who has also been reading them for a long time, that we talk about Lovina and her family like they are part of our families. Thank you for introducing us to Gloria, enjoyed her intro and receipe. Welcome aboard! Welcome Gloria! I am already interested in your sweet family! We will miss Lovina & her family but are so glad you stepped in! I know she has her hands full with her children & all. Thanks for taking time from your busy life to let us have a peek! Kevin, please thank Lovina for all her years of letting us be a part of her life! Welcome Gloria. The recipe sounds delicious. I look forward to reading your columns and your recipes. Welcome Gloria! I am looking forward to reading your columns and hearing about you, your family and delicious recipes. Welcome Gloria. Will avidly look forward to your recipes! I too will miss Lovinia’s column & family info. Nice first column, Gloria. Look forward to more from you. Do you have a recipe for cheeseburger soup? Ate in an Amish restaurant last week in Lancaster, PA and this soup was absolutely wonderful. Thanks for your help. looking forward to learning more about your family . I was so surprised not to see Lovina’s writing that I forgot to welcome Gloria. I’m looking forward to learning more about you and your family and to new recipes from you. Welcome Gloria. I’m looking forward to reading about your young and growing family. I also like the idea that you cook and bake from scratch and not use processed food. This sounds like a winner of a recipe…one that won’t be made in my house due to the fact that we’re not pie/cake/cupcake/cookie eaters. GASP. I know…shocking. As a very sad side note, no more Lovina? I LOVED reading about her family and her recipes…albeit on occasion repeats…but, don’t we all repeat our fave recipes? I know I do. I’m hoping that Kevin lets us in on the reason why no more Lovina. I almost thought of her as family and when hearing about bad weather in her “neck of the woods”, I’d wonder how she was making out. If this is the end of Lovina’s column, farewell to an old friend. I am so sad to hear Lovina is not going to be writing the column. I so enjoyed every one of them! I am especially happy I purchased The Best Of the Amish Cook vol 1-4 so I have many of the Eicher recipes. I always loved hearing about her enormous family and all they were up to. She is a very sweet woman and will be missed. But you have a wonderful replacement!!! I loved Gloria’s first column just as much. She has such a nice way about her. Looking forward to reading more about her “all homemade” cooking, which really interests me, and her family. I would love to learn how she makes her homemade yogurt she mentions! I hope Lovina will let us know maybe once a year what has happened in their lives. They feel like family to me, in fact my daughter calls them my Amish family. Blessing to all of Lovina’s family. Welcome, Gloria! I know I will love your columns as I did Lovina’s. Perhaps you will write a cookbook with natural recipes. When Lovina published her first cookbook, I met her, her husband and all the children at a bookstore in Cincinnati. I have enjoyed reading her columns and recipes and remembering the family. Also met Kevin Williams and his lovely wife, Rachel at the book signing. May God Bless you and your family! It was a pleasure to meet you, Gloria! Your pie recipe sounds absolutely decadent. No wonder your husband loves the recipe so much. I look forward to hearing more about your family and enjoying the recipes that you share. Congratulations on the new little blessing coming this fall! Children are such a wonderful gift and treasure from the Lord. Kevin, please thank Lovina for all those years taking over the column after her mother died. I’ll miss hearing about her family. Please let her know she and her loved ones will be in my prayers and that I hope to hear an update about the Eichers from time to time. A hearty welcome Gloria. I enjoyed your column today, however I must say this was quite a surprise. I too will miss Lovina’s column. I appreciate the years she put in to her writing. We have heard about her children as they have grown up. Now we get the opportunity watch another young family grow up. God bless your little family. Welcome Gloria! Enjoyed your 1st column. Looking forward to the next column. Welcome Gloria! Your recipe sounds really good and I will be anxious to try it. I also like the fact that you cook from scratch. I have been looking for a homemade cream of mushroom ( or celery as the case may be) for years. I hope you will share yours with us. All the best to Lovina and her family. I too hope we will get updates about them. Kevin, Thank you for allowing us to meet Elizabeth Coblentz and then her daughter, Lovina Eicher over the years through their columns. They were always delightful. We will deeply miss Lovina. Welcome, Gloria! We look forward to meeting your precious family through this new column. Gloria, a hearty WELCOME to the Amish Cook family! And I am sure you will become every bit as much family to us as Lovina was. It will be a nice change to have more “from scratch” recipes. You are a young family and we hope to have a peek into your lives for a long time to come. Welcome Gloria. You are off to a great start. Will so enjoy hearing about you and your growing family. Thanks for joining the team. On a sad note, Kevin please tell us that you will update us from time to time about Lovina and family. I will so miss hearing how the family is doing. Could you give us just a little reassurance? I am really curious why Lovina left and not one word was posted in regards to such? I have followed her and her mothers column since I moved to Indiana from Ohio and just shocked that nothing was written by Lovina or yourself Kevin stating and thanking Lovina for all that her and her family including her mother have contributed to this column! Please let Lovina know that she will be missed and nevertheless welcome Gloria, I so look forward to reading your letters and recipes!!!! Hi, Sue, thank you for the kind words. It was an abrupt, unexpected departure and I’ll write more about it in due course. But, of course, I wish Lovina nothing but the best and hope you enjoy Gloria!